Just seven laps into the 1964 World 600 at the Charlotte Speedway, popular NASCAR driver Glenn “Fireball” Roberts couldn’t avoid the wreckage caused by the crash of Ned Jarrett and Junior Johnson. 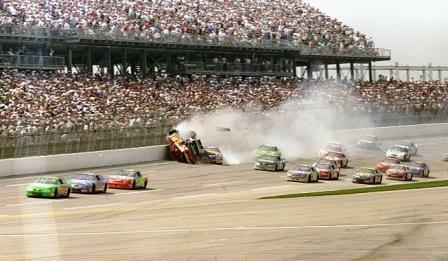 As a result, Roberts slammed into the wall, where his car rolled over and burst into flames. The incident left him with burns over 80% of his body, forcing him to be airlifted to a nearby hospital. After fighting to recover, Roberts developed pneumonia, fell into a coma, and unfortunately passed on July 2, 1964. The tragic affair forced NASCAR to require all drivers to wear fire retardant clothing, while also installing in-vehicle fire extinguishing systems and replacing the steel tanks with rubber ones.